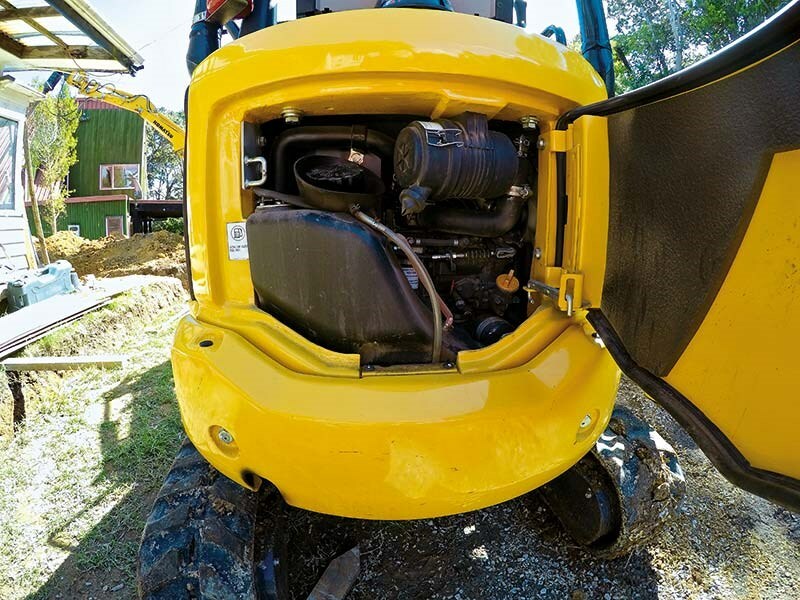 Things can quickly go from bad to worse when you're working in some of the conditions that David Manson from Manson Machinery finds himself. At the moment he's racing to stay ahead of the rain as he works on an awkward site in Lynfield, west of the central Auckland City. Thankfully his Komatsu PC18MR-3 will help. "I did my due diligence and looked at a number of different brands," says Manson. 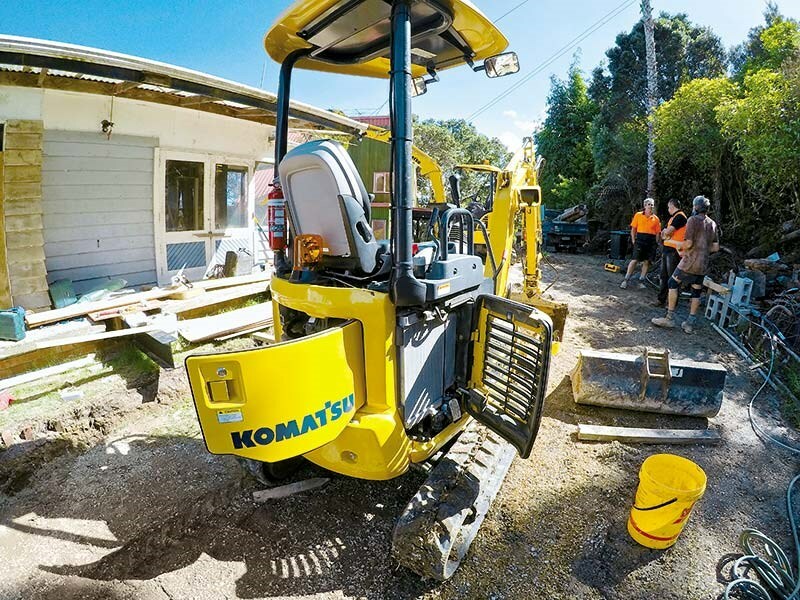 "There was another brand that I was keen on, but kept coming back to Komatsu. Looking at the others kept me honest." 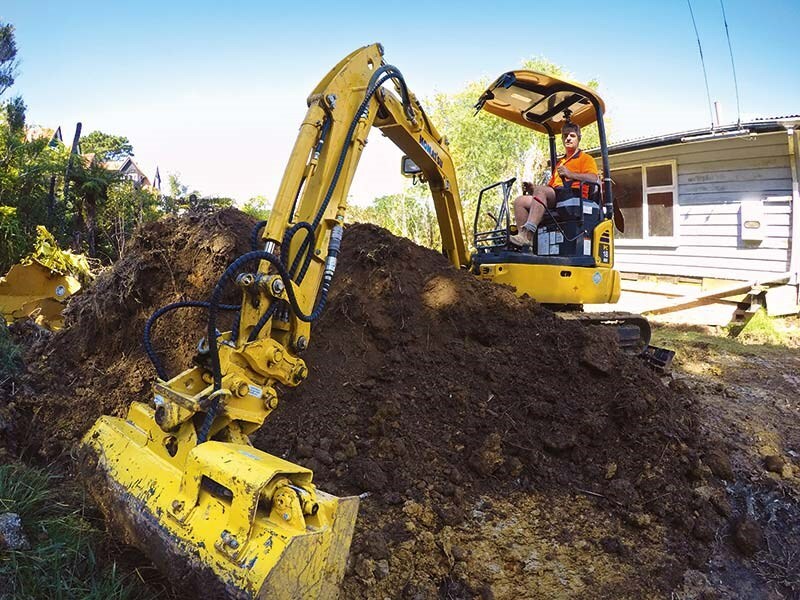 What he is talking about is the two Komatsu excavators – a PC35MR-3 and a PC18MR-3 – that he has purchased over the last six months. These replaced his MR-2 model Komatsus that had clocked up a few thousand hours. The machine we are here to look at today is the 1.8-tonne PC18MR-3. 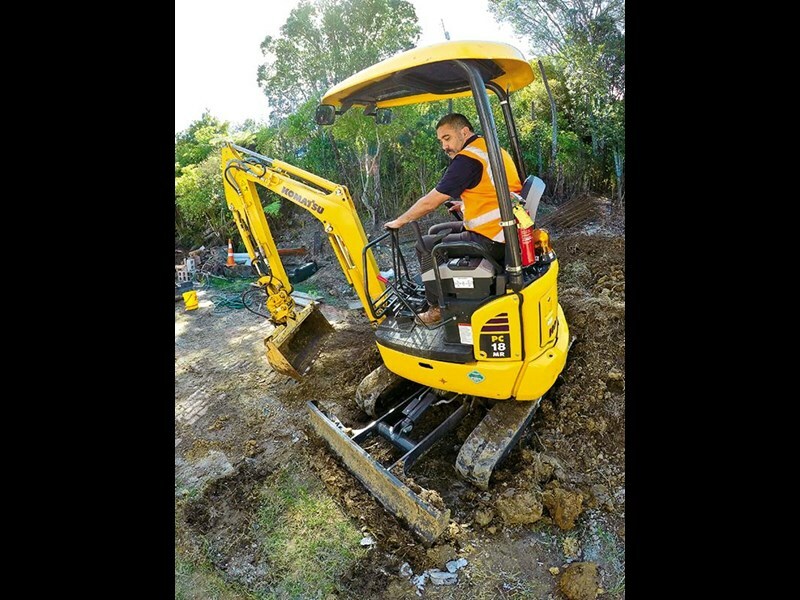 This nifty little excavator is proving popular with operators and hire companies, being the reason that Manson had to wait in a holding pattern until his machine was delivered. The grin on his face as he shows us around his latest acquisition easily tells that the wait was worth it. He's very happy with the purchase but there are a couple of changes he would have done if he was in charge of the Komatsu design studio. So, what's the PC18MR-3 all about? For starters it's big (or small) enough to fit on a ute-towed trailer, so that explains the interest from hire companies. The expandable tracks – 900mm to 1200mm – mean that tight urban access problems are easily solved, so that explains the interest from contractors and drainlayers. 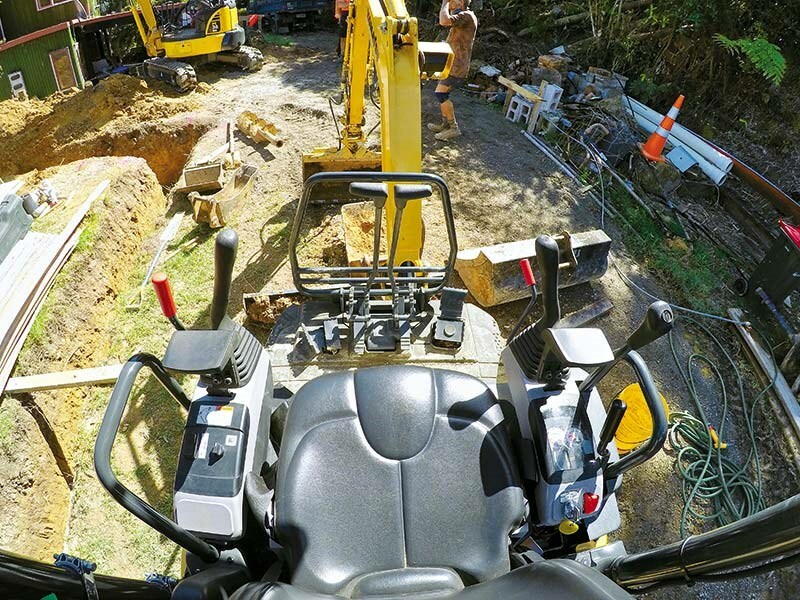 Manson has JB Attachment hydraulic hitches fitted to both his Komatsus and he says this adds to the versatility of the machines and means he doesn't get lazy about changing buckets when the job at hand calls for different tactics. Different tactics are certainly what is needed in Manson's daily grind, as most of his jobs are on tight, steep sites that frequent the area that he predominately works. 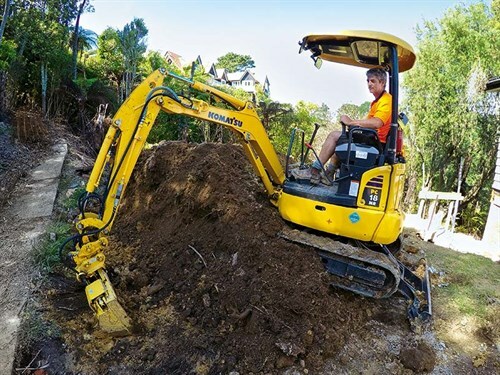 Stuff like this is not for the faint hearted and many a digger operator that I've seen boasting about their prowess wouldn't survive more than a day in conditions that Manson works, before going home crying to their mamas. One benefit, as Manson explains, is the low centre of gravity that the excavator affords. He points out the side counterweights that, in addition to the rear counterweight, make the machine very stable. This particular area was one of the reasons Manson forked out more money than he would have on some other brands to buy a Komatsu, as he points out the extra space available for the operator. "Yes, I could have saved a few grand and bought something cheaper that may have done a similar job. But when I'm spending all day on a machine for weeks on end, the extra space it gives means that money becomes insignificant." Another important feature are the two entry/exit points. Most other brands have only one of these, so again, the versatility of the machine is noted. This area however does come into some criticism from Manson, as we previously alluded to. On the PC18MR-2 model, the left-hand control console pivots up and out of the way to provide a wider gap for an exiting or entering operator. On this new model, the controls are fixed and although there is a decent amount of space (some 560mm), there is a definite chance of getting shorts, especially the thigh pocket of cargo pants caught, which can easily throw someone off balance. It is difficult to understand why this has been done, but no doubt a plausible explanation is out there. The other change Manson would like to see is the replacement of the steel canopy with a plastic one. I was wondering if he was referring to a noise problem during heavy rain? "No," he says. It was the damage these types of canopies incur when working in tight areas – heavier plastic being the preferred choice, due to its ability to 'pop' back into shape. After talking to Manson for a while, I had almost forgotten that the reason for looking at the machine was to give it a test run. Seeing it was already set-up on a stockpile, it was a simple matter of climbing aboard and giving the engine some revs. One thing I noticed immediately was the intuitive layout of the controls, and even though this was the first time I had operated a small Komatsu excavator, my hands intuitively landed in all the right places. Another noticeable difference I picked up on was the stability, and despite the front of the tracks being firmly planted in the stockpile of soil and the rear of the tracks hanging in mid-air, being lifted there by the blade, I was able to operate comfortably without the machine pitching and rocking my internal organs as much as I would have expected. Power supply to the hydraulics was more than adequate, and to be fair I wouldn't have expected less considering the work the machine was undertaking. Having finished my stint aboard, I did come away from the PC18MR-3 genuinely impressed with its stability, comfort and operating capabilities. I did agree with David Manson's observations about the machine. After all, he should know, as his last model had done over five-and-a-half-thousand hours when he upgraded. Granted, these machines carry a heftier price tag than some other brands, but Manson does make a very strong case for that cost difference. If I was spending as much time aboard a smaller machine as he does, I'm quite sure I'd be thinking the same way. For more information contact Komatsu on 0800 566 2878. 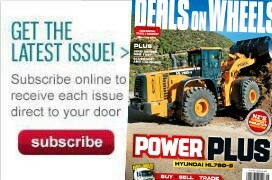 Deals on Wheels puts a Komatsu PC18MR-3 excavator to the test in this video.